Take in the incredible panoramic mountain views in this 1550 sqft beautifully decorated 1 bedroom/1 bath log chalet with all the amenities. All natural wood inside with large living/dining and kitchen area with flat screen. King bedroom is complimented with satellite TV, flat screen and outstanding views. Master bedroom is on the main level. Perfect for a couples getaway. Kitchen comes fully equipped with all the amenities including granite counter tops with under the counter sink, crock pot, regular coffee and Keurig coffee maker. Pool Table and Hot Tub. Easy access in and out with ample parking. Located just 5 minutes from downtown Gatlinburg. 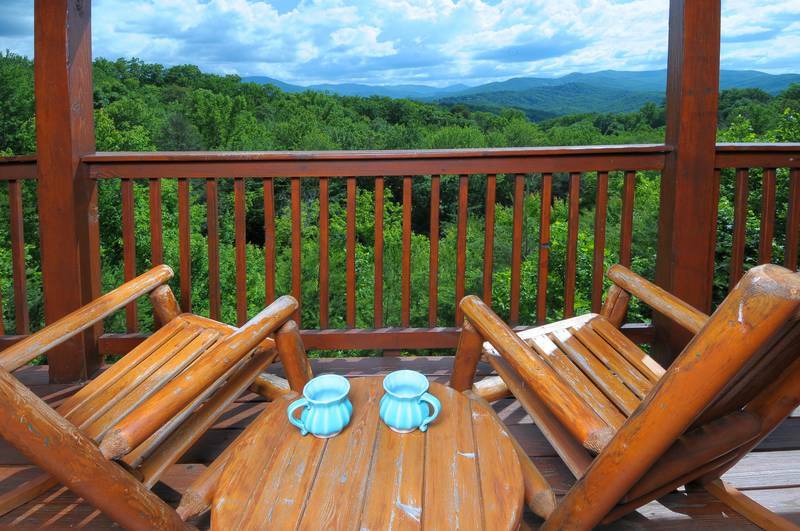 This unit boasts the most breathtaking views in the Gatlinburg area.